OMG! Which is text-speak for Oh, my god! I don’t text much but in this case this is certainly an OMG moment. 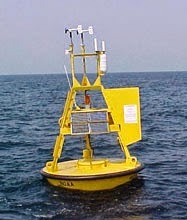 I watch the south Lake Michigan weather buoy read-out almost every day during the fishing season. 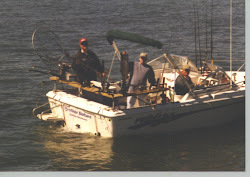 It’s only about 50 miles or so from the area I normally fish and when dealing with weather and weather patterns, 50 miles is hometown news. So today, regardless that the Brother Nature is stowed safely away for the winter, the strong wind warnings, lake snow forecasts, etcetera, I clicked up the midlake buoy. I’ve never seen anything like this! I’ve been out on the lake multiple dozens of times so I know what the wind and wave conditions were, first hand. Then I’d compare it with the midlake buoy, “real-time” reports. The wind conditions were usually spot on with my “guestimation” of how strong the winds were blowing. The wave conditions never aligned. I finally decided the buoy didn’t measure wave heights from the bottom of the trough to the peak of the wave, it was more like the buoy measured only from mean lake level to the peak of the waves. There’s probably “scientific” reasons for doing it this way, but if you are out on the lake, expecting two-foot waves, as measured by the buoy, and are really in four foot waves, measured from trough to peak, that’s a big difference. Lake Michigan must have looked like this! So looking at today’s weather buoy info (October 31, 2014) is pretty darned scarey. I’m glad I’m not out there. The wind is blowing from the north at 38.9 Knots (44.7 miles per hour). Gusts are 50.5 knots. The buoy at Michigan City pegged a gust at 67 miles per hour. More importantly, the wave heights measured by the buoy are 21.7 feet. 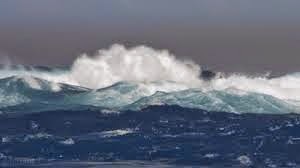 I’ve never been out there to decide if the measured waves to actual wave heights (2 foot vs. 4 foot) is similar when the buoy registers waves of double digit heights; but if it does, that means 40-plus foot waves blowing down the lake. I’m glad I’m not there!